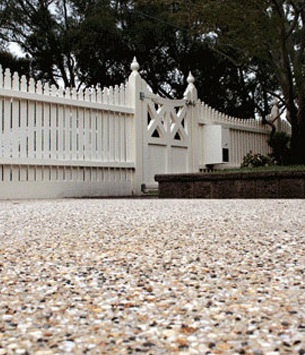 Our wide selection of innovative concrete and exposed aggregate surfaces will provide the finishing touch to your new driveway. Select from simple or designer finishes to create striking home features or a seamless blend with nature. 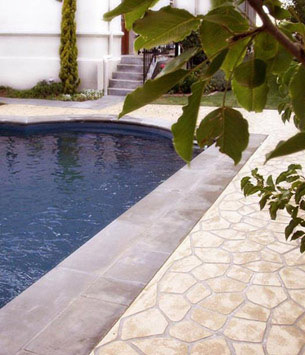 Decorative concrete is highly adaptable in both style and application. With your vision and our creativity, ideas become reality. The result is an exact lifestyle fit, whether you choose coloured concrete, textured finish or exposed aggregate. Whether it’s a new installation or an update, Simply Driveways has the ideal concrete driveway solution for you. Not only will a decorative concrete or exposed aggregate investment add value to your home, we are now able to provide driveway services that are practically maintenance free, and more economical than pavers and many other types of hard landscape options. There’s almost no limit to the combinations of colour, texture and form. Simply Driveways will achieve your look precisely with natural colours and organic textures like stone and brickwork. Fabulous job, no hiccups , great communication, very professional, suggested options I hadn’t even thought of (as in improvements to my original thinking), I’d recommend you to anyone and already have. Three families in the street are now saving to have similar work done. With Simply Driveways, you’re guaranteed a driveway that’s simply amazing – every time!